You’ve just created the design that, more than any other, was the signature of electronic music making in the first decade of the 21st Century. What’s your second act? Having made the monome grid controllers the biggest design hit in music creation in the last few years, then moved to a farm in upstate New York to do some … farming (really), monome’s Brian Crabtree now and Kelli Cain have made public what’s next. Think really big knobs. The design makes some sense to me, intuitively, already. Livid tried the obvious solution of combining encoders with arrays in its Code, but having a big cluster of encoders, while interesting, seems that it’d have limited applications. It works for Livid, but given the widespread impact of the monome, you’d expect something more generalized, more universal. Arc could be that. They’re large, “ultra-high resolution” encoders. The monome sacrificed sensitivity for quantity with an array of on/off toggles; Arc does the reverse. The idea is presumably that you’ll really care about these big knobs. Two- and four-knob versions are promised; the four-knob variant seems like it might have the greatest appeal, depending on the price difference. The visual feedback on the side are “high-density LED rings,” but they also have “variable brightness,” meaning that they could be more visually compelling than is apparent in still photos. In addition to being knobs, each knob is a push-button. Unlike the monome, it’s hard to see this being the only controller you’d use. 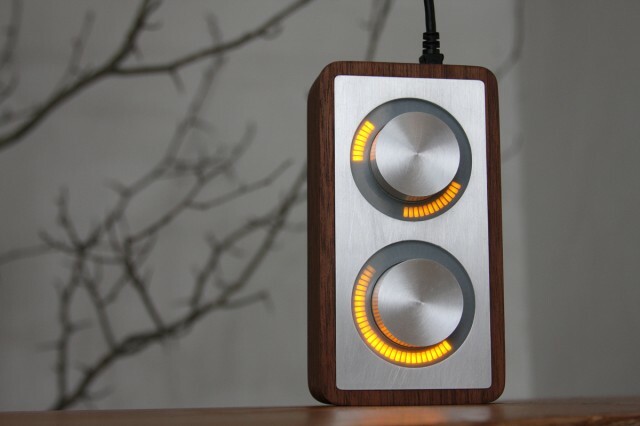 It is easy to imagine it used in conjunction with another controller, though, monome or otherwise. I’m imagine that as on the monome, you’ll be able to modify the design to add tilt sensors and the like. Like the monome before it, the arc makes no sound. It requires computer software and the OSC (OpenSoundControl) protocol in order to control software, connected through a USB port. And so like the monome, you can expect that a lot of its value will be software inspired by the quality of the design and even the high-value construction of the item. If it’s like its predecessor, the arc will be an attractive window through which clever software designers imagine new musical contraptions. Pricing, details, media due later, with “orders and shipping in February.” I can say it’s real; I saw some version on Brian’s workbench. I think, having passed on a trip to Anaheim, that readers might like to get hands-on coverage of the Arc, and a serious look at whether the monome’s sequel will live up to the original. Do you agree? Side note: People I’m talking to are already wondering what you would do with, you know, two big wheels. I refer you to Etch-a-Sketch (two wheels), your car (one big, necessarily high-resolution wheel)… I was initially skeptical of how the monome would work as an instrument with no velocity sensitivity, and was eventually won over by a combination of ingenious software and musicianship by its fanbase. I wouldn’t write off the minimalism of this just yet. Update: stretta already has an app in the works for the arc. He mentions that in a blog post with an adorable illustration that, aside from being clever, suggests how many people will use this app. See the video after the jump – notice the PowerMate controller in the corner of the video? It’s apparently standing in for an arc. Getting the picture? 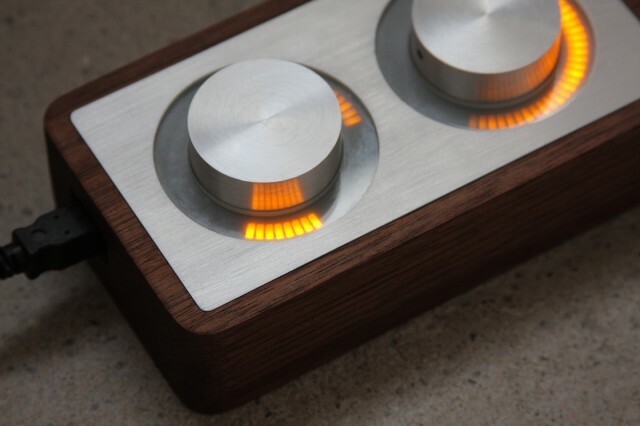 The design already shows the attention to detail lavished on the monome. Photos courtesy monome.